this painting is to get my mind off of artist worries, from me thinking "what *should* i be painting now" or "what might others want to see me paint". it may go up in the shop or it might just be one of my secret stash. 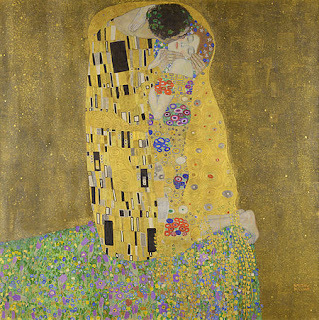 "the kiss" by gustav klimt was painted between 1907 and 1908 during his "golden period". copyright laws state that even if a painting is held by a museum or collector they only hold property rights, not copyrights. the artist and their heirs only hold copyright for 70 years after the artists death. then it becomes public domain. klimt died in 1918 and his works became free to use in 1988.
apparently, this painting was huge at just under 6'x6', with lots of detail. the biggest canvas i have right now is 16"x20", so the first thing i decided to do was crop the image i wanted to paint. i do not need the pressure of teeny-tiny faces and hands to drive me batty! i then painted the canvas with a metallic gold, and started sketching directly onto the canvas with a handy eraser nearby. it will be interesting filling in the faces and clothing with his style.